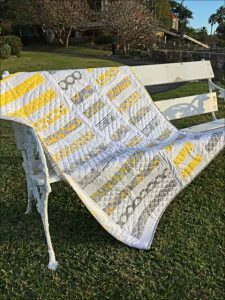 I’m very excited that I was able to be a part of the Fat Quarter Shop’s most recent quilt-a-long – The Layer Cake Custard Quilt. I chose Bonnie and Camille’s The Good Life fabric for my quilt. I was determined to use only fabric from my stash, and I had just enough of the green stripe to use as background. The blocks pieced together super fast – it took two evenings only. I always chain piece my blocks – it’s so easy. I was ably assisted by my two junior associates – here they are hard at work helping with the final layout. I quilted it on my Janome 6600P, using the quilt as you go method. I used a mixture of spirals and straight lines. As always, I used Aurifil thread – shade 3320 proved to be perfect. 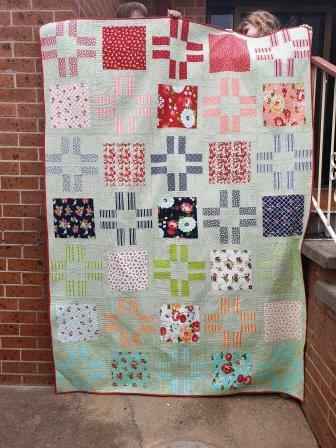 QAYG is perfect if you don’t have a huge space, or if you aren’t able to manipulate huge quilts. 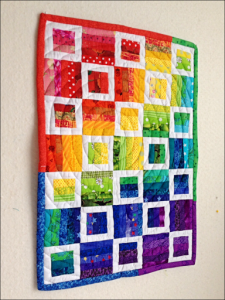 Fat Quarter Shop have created a video tutorial for this quilt – go check it out and have fun! 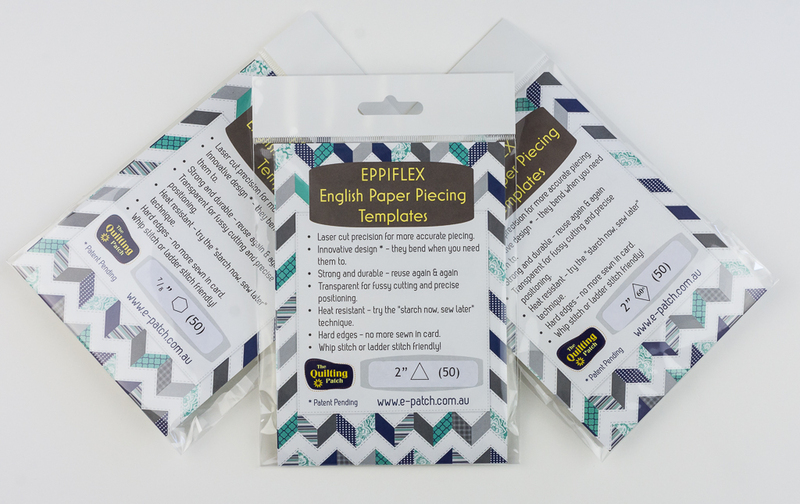 Product Review – Eppiflex Templates from The Quilting Patch. Every once in a while you find a gadget that just WORKS. 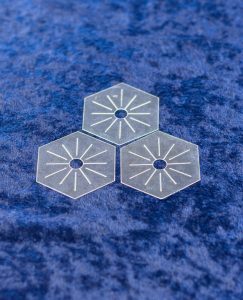 The Eppiflex templates from Danni at The Quilting Patch is one of these. I LOVE English Paper Piecing. I’m currently working on La Passion, La Passacaglia and The New Hexagon. I also love fussy cutting. The problem with traditional papers is that after you have painstakingly fussy cut them, you have to turn them over and glue or stitch then down. When you do that you only see the paper not the fabric underneath. This is where Eppiflex templates come in! They are clear so when you lay them down onto the fabric you can see through them, ensuring that your fussy cutting remains accurate. You can see above and below I was working with the tiny pinwheels on this fabric from the Gooseberry range from Moda. I road tested the diamonds and received a pack free of charge. I found these templates so easy to use. Of course you can’t thread baste with them but I’m a glue baster anyway so that was not an issue. As with paper templates, I only needed a sliver of glue to secure my fabric. It was actually easier to stitch than paper templates. The edge of the template is very clear and my needle glided over it neatly. The templates were also very easy to remove. One of the other great things about Eppiflex templates is that they are washable – just pop them in a lingerie bag and into the washing machine. 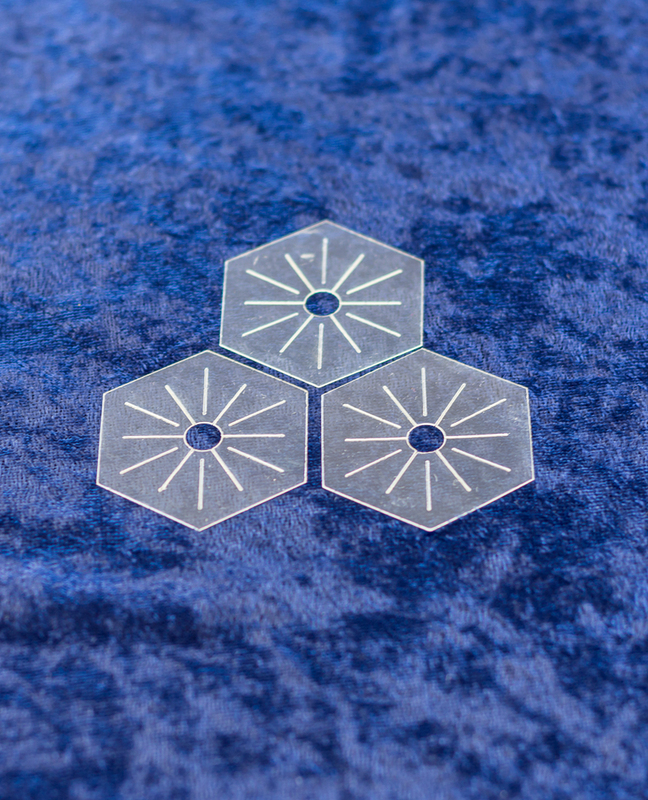 As well as the templates I received, I have bought the New Hexagon and Passacaglia sets as well as a heap of ¼” hexies for La Passion – suffice to say I’m definitely a convert! 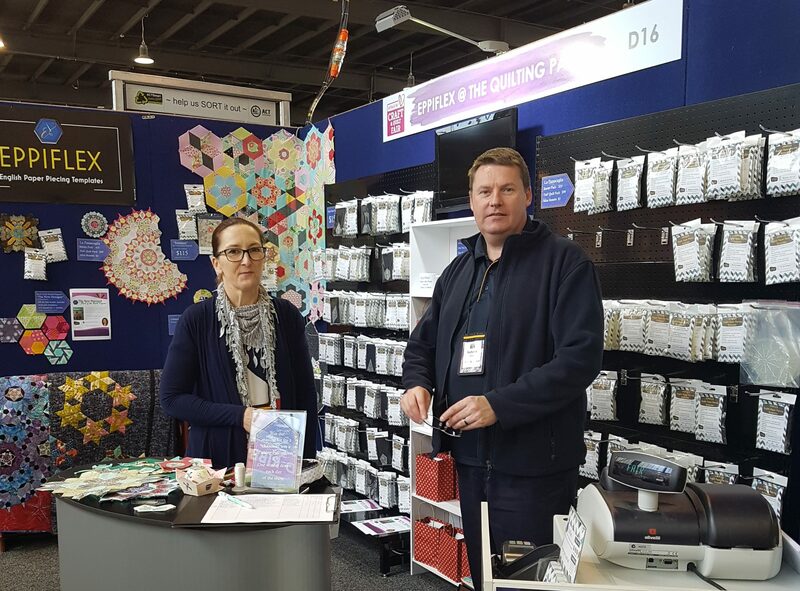 Eppiflex templates can be purchased from The Quilting Patch at Nowra, or from their online store. 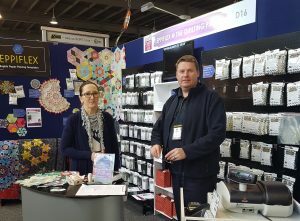 Danni has also been doing the show circuit – I was so pleased to be able to finally meet her at the recent Canberra Craft and Quilt Fair. 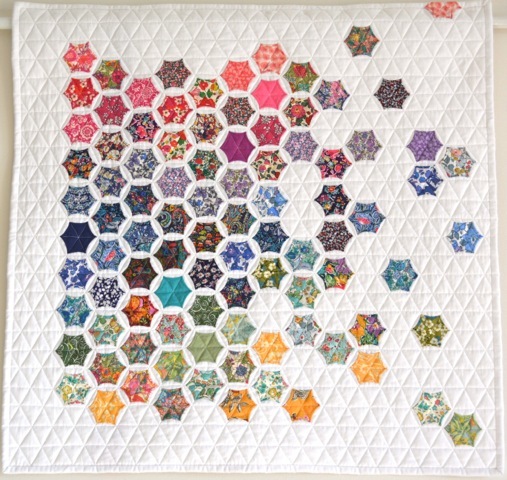 There are a number of packs available – you can purchase shapes by themselves as well as kits for The New Hexagon, Lucy Boston, La Passacaglia and many others. I hope you enjoy using these as much as I did. I’m so excited to share my latest project with you, Creative Christian Entrepreneurs. I have been dreaming of this for quite some months. I have read A LOT of business building books, books about fostering creativity, books about budgeting for business and home and general personal development books. I have become very interested in what it means to be a Creative CHRISTIAN Entrepreneur – what does God think of these things? Is it OK to be creative (yes! ); is it OK to be an entrepreneur (yes! ); is it OK to make money (yes!) – What does the Bible say about these things? I couldn’t find a group where these topics were discussed, hence I’ve created one! This is a safe place for you to ask questions, talk about your projects, connect with fellow entrepreneurs, discuss the Bible and be encouraged. If you are a Christian in creative practice and/or a SME Entrepreneur, come and join us. Sign up here and you’re guaranteed the same fee for as long as you remain a member. 1 August is the day! Once you have signed up, you’ll be given an invite to join our Private Facebook Group. This is open now, and it’s there where we will be getting to know each other before the official launch date. NB: Any monthly membership purchased between now and 31 July will be valid until 31 August; Six monthly until 31 January 2018 and Yearly until 31 July 2018. Your membership renewal will be at the same rate as your original signup fee as long as you have been a member continuously since sign up. Join us as we read some great personal development books and discuss how we can implement them in our creative practice. We’ll be meeting some fabulous Creative Christian Entrepreneurs and learning from them. What DOES the Bible say about being creative? Let’s find out! We’ll have monthly meetups in Canberra (and Sydney on occasion) as well as monthly virtual meetups via Skype or Google Hangouts. This is in addition to our regular Facebook Groups. SIGN UP HERE but be quick, Foundation Memberships will be capped at 50 – once our 50th member has joined, membership will close until 1 August at which time the joining fees will rise. My Curious Miss is in her first year of big school this year! I’m still not quite sure how that happened. Her preschool teachers are two very special ladies. They taught Little Boy two years prior, and there were around 14 children in the class whose older siblings were in Little Boy’s year. This called for a super special Christmas gift for them considering we’ve now known them for three years. I enlisted the help of the other preschool teacher to trace each child’s hand print onto paper and also to tell me their favourite colour. From there I traced the hand prints on to Vliesofix and then onto fabric in their favourite colour. Once affixed to the blocks, each child signed their block with a Pigma pen. 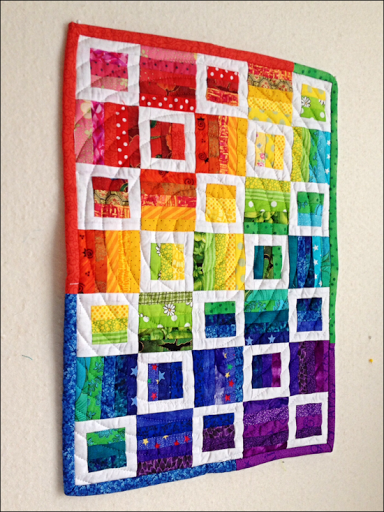 I quilted each of the blocks using quilt as you go and then joined them using bias strips on the back. I added some hippo fabric which I bought at Hobbysew and I think they look quite cute really. What’s the favourite handmade gift you’ve given or received? How is this year going for you? It’s the end of February – how did that happen? I’m very pleased to let you know that the Aurifil Thread Club is now open for subscriptions. Over the course of twelve months you’ll receive a total of 72 small spools of 50-Weight Aurifil thread in carefully selected colours. I use Aurifil thread for machine piecing and quilting – they are a 100% cotton thread and very smooth. They don’t break or twist easily. Will you join the club? You can either pay per month or in two six-monthly instalments. Pay in two instalments and you’ll receive a free Vine Lines Creative pattern. Ready to sign up? Click here for the two six-monthly instalments and here for monthly instalments. 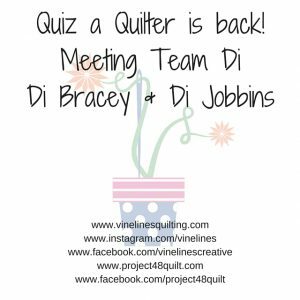 Introducing Project48Quilt – returning bigger and better in 2017! I’m popping into the blogosphere today because Crystal from Raspberry Spool and I have been hard at work on Round Two of Project48Quilt, which gets underway on 6 January 2017. We sat down to do some filming last week and have made this little video so you can get to know us better. I hope you like it! Subscriptions are now open to the general public (our 2016 subscribers had the chance to subscribe ahead of time) and we would love to have you join us – you can subscribe here. I look forward to seeing you over at P48Q! 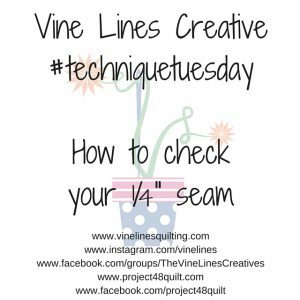 Welcome to the new Vine Lines Creative #techniquetuesday. I’ve created a new Facebook group for you, with daily prompts. Please do come and join us, it’s going to be a lot of fun. 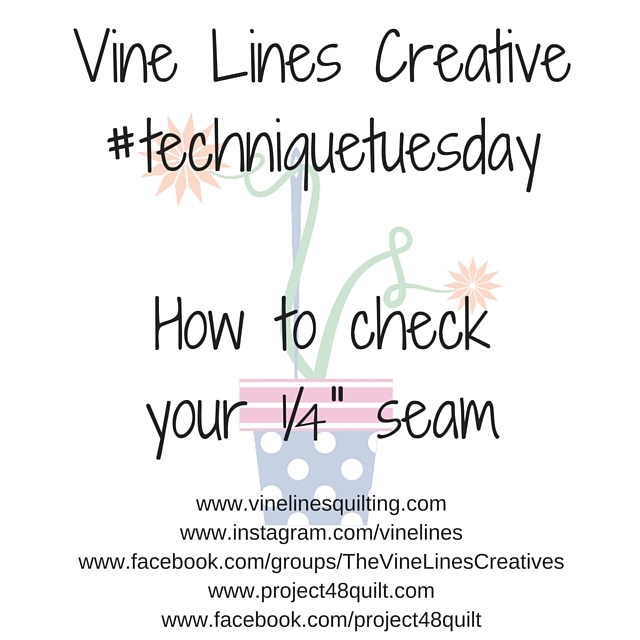 Our first technique tutorial is how to check your ¼” seam. One of the first things you learn in quilting is that the ¼” seam is paramount. It is used as the standard in all patterns except for some foundation piecing projects which use a smaller 1/8″ seam. 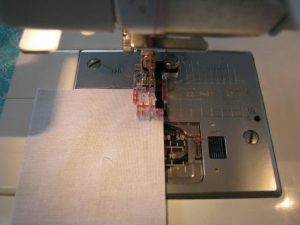 Quarter inch feet are available for the majority of sewing machines however they can loosen over time so it’s important to check you are sewing with an accurate seam. If your seam is slightly out, it may not matter terribly when sewing one 6½” block but if you multiply that by the amount of blocks needed for a queen sized quilt, your final measurements will be way out. Here’s a tutorial to help you to ensure your ¼” seam is accurate. Cut three rectangles 2½” x 6½” – I used two different colours but it really doesn’t matter. Stitch the rectangles together, pressing seams to the side. Measure the resulting square. It should measure EXACTLY 6½” square. 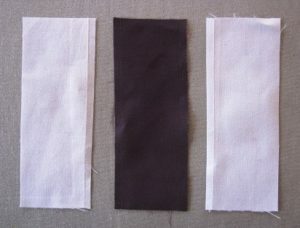 If the piece is narrower than 6½”, then your seam is greater than ¼” and you need to move your marker a little to the left OR move your needle a little to the right, or move .If the piece is wider than 6½” then your seam is smaller than ¼” and you need to move your marker a little to the right OR move your needle a little to the left. Please jump into our new Facebook group and let me know if you found this tutorial helpful. Greetings! 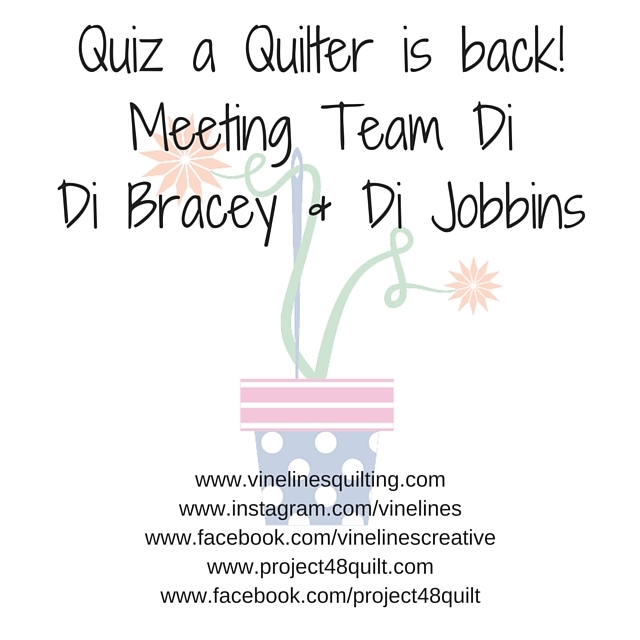 I’ve decided to reinstate my Quiz a Quilter column on an occasional basis and I am delighted to introduce our first two subjects – Di Jobbins and Di Bracey. 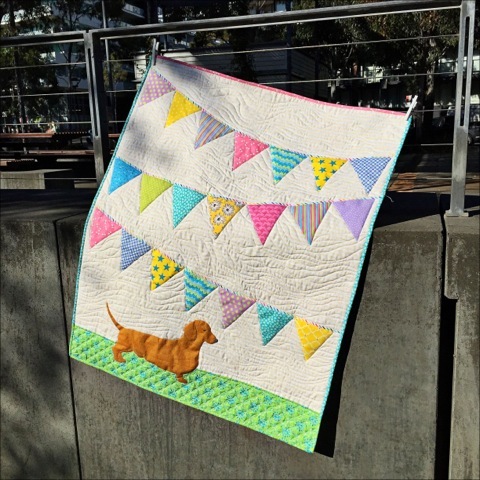 Team Di create the most beautiful, fresh and colourful quilts and coordinate a quilting group in Sydney. II was so pleased to finally meet them both at the Craft & Quilt Fair this past weekend- here’s a pic of a Linden between two Dis which was taken on my mobile. Di J: I have three adult children and three grandchildren. Three years ago I moved, with my black labrador Chester, from an elegant historic Victorian sandstone rectory to a modern high rise apartment in hip-and-happening inner city Zetland. It’s been a huge change, but I’ve tried to embrace it and these days I describe myself as “urbanly renewed”. I think my quilt-making style has moved with me and become more modern too. Di B: I’m a quilter and a member of Paddington Patchwork. Di Jobbins and I started St Mark’s Quilters six years ago and we co-ordinate it together. I am a dog lover; we recently said good bye to my beloved and beautiful golden retriever, Matilda, and I live with my 90 years young mother who is also a quilter. We have a very special time stitching together. 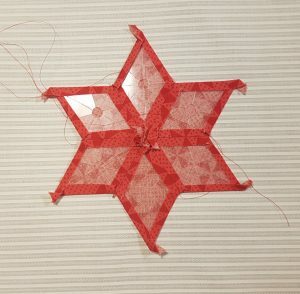 What’s your earliest memory of sewing/craft? Di J: My Grandma used to make all her clothes on a treadle machine, and I clearly remember, around 8 years of age, sitting on the verandah of her Queenslander, cutting up scraps of her fabric and handstitching them into clothes for my dolls. Di B: I’ve always loved fabrics and sewing, and started making my own clothes around the age of 16. 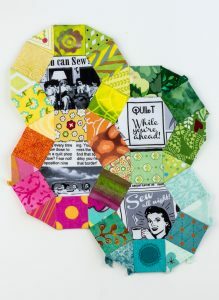 Di J: That depends… I started stitching hexagons together and making a quilt for my first baby about forty years ago, and ever since then I’ve dabbled in quiltmaking. Being self-taught, though, I broke all the rules and made some ‘shockers’ that I’d rather forget. I really only started to learn the craft of quilting properly in 2003 when I joined the on-line group Southern Cross Quilters. 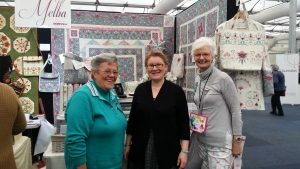 Here I discovered a huge friendly community and began to pick up tips from experienced quilters like Jenny Bowker, Lisa Walton and Pam Holland. 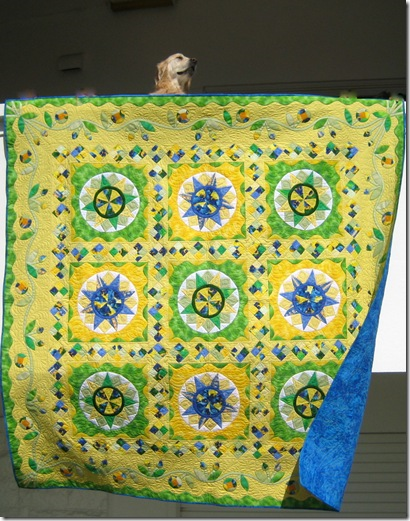 Di B: In about 1995 my sister-in-law invited me to join a “Log Cabin” workshop with her and this was my first patchwork project, making a double bed doona cover. Then when I met Di J (it’s all her fault really!) we decided to go on our first “fabric safari” visiting quilt shops around Sydney for the day. We had a ball together, and the rest is history. 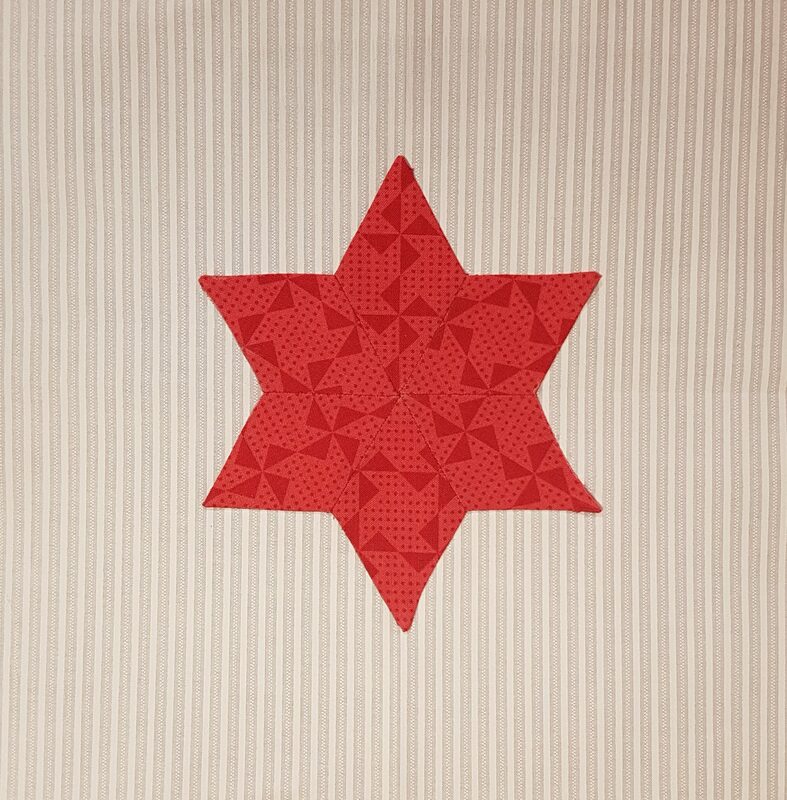 What’s your favourite part of the quilt-making process? Di J: Definitely the quilting itself! 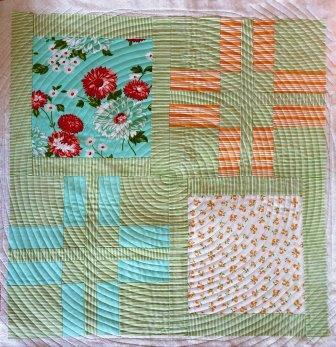 After taking several free motion quilting classes, but falling by the wayside for lack of practice (who knew? ), two years ago Di Bracey and I decided to hold each other accountable and seriously jump into learning domestic machine quilting. 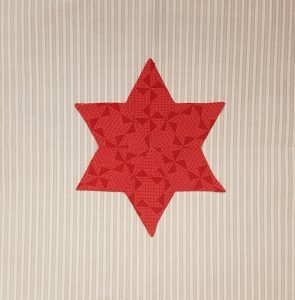 We worked our way through some of Angela Walters’ Craftsy classes, and took part in a “daily FMQ” challenge run by Carrie Hanson @gotchacoveredquilting on Instagram, which helped motivate us to practice. 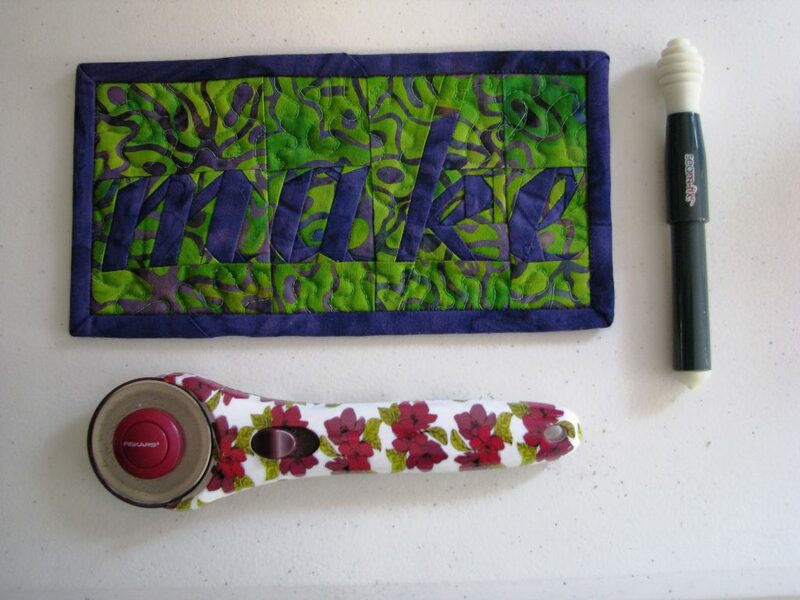 These days I love plotting and planning my quilting designs as I piece, and I would definitely say that domestic free motion machine quilting is the part of quilt making that gets my heart racing. I love the texture created by quilting! Di B: That’s hard to answer. 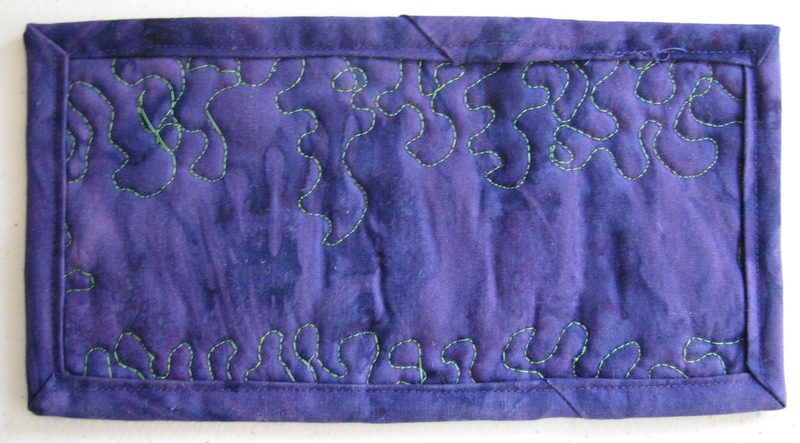 I love choosing the fabrics, and watching the patterns evolve as I stitch, and I really love the binding. The sandwiching isn’t my favourite task though. Di J: I’ve just finished the my entry for the 2016 Sydney Quilt Show. It’s called “Out of the Square”, I’ve designed it myself, and it’s a very colourful, modern interpretation of the traditional Cathedral Windows pattern. At the same time Di B and I always seem to have a quilt percolating along for either Royal Prince Alfred Hospital’s Newborn Intensive Care Unit or the KU Marcia Burgess Autism Specific Early Learning and Care Centre at Liverpool (“The Marcia”), both of which we support through St Mark’s Quilters. 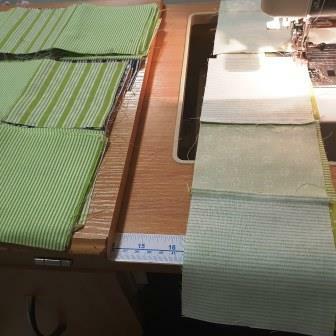 Di B: Like most quilters, I’m currently working on a few projects. I’ve just finished a king size quilt, “The Chocolate Box”, by Lynne Alchin, with a few of my variations. It took me at least 2 years and will be a gift for my sister. 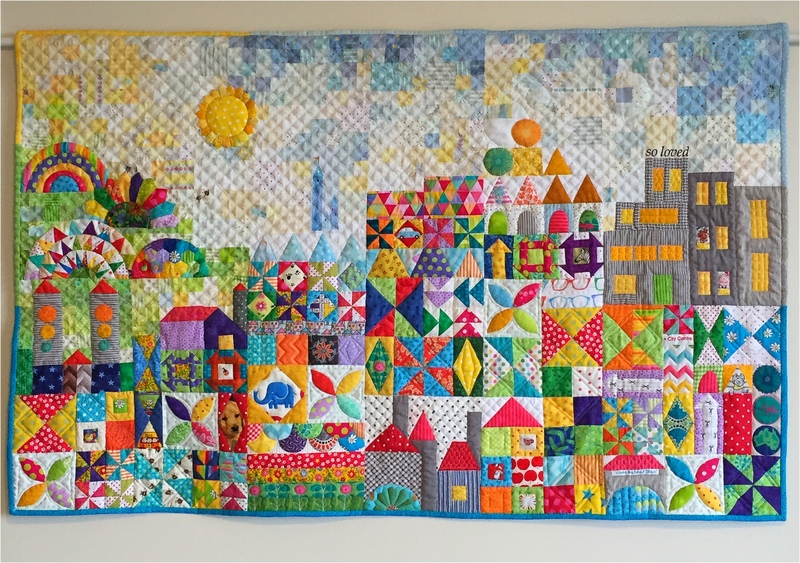 I’ve entered my version of Cristina Tepsick’s “Hillside Houses” in this year’s Sydney Quilt Show and, in between making quilts for St Mark’s Quilters, I’m using a bundle of Karen Lewis’ Blueberry Park fabrics in rainbow colours to make Julie Herman’s “Arcade Game” quilt for my grand-niece. When did you meet each other – how did you become friends? Di J: Di B and I met at our church, St Mark’s Darling Point. At that time she had a business making children’s clothes and selling them at weekend markets. As stitchers we were something of an endangered species in our part of Sydney, so it was natural that we became friends. Di B: We first met when Di’s husband Boak arrived as our new Rector at St Mark’s Church, Darling Point. As we got to know one another, we learnt we both shared a great love of fabrics, craft and stitching and our friendship grew from there. 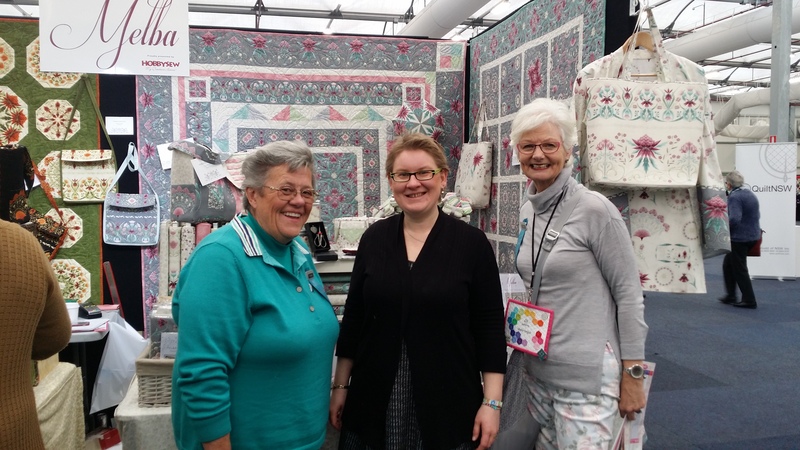 Tell us about St Mark’s Quilters – why was it formed/how long have you been running etc. 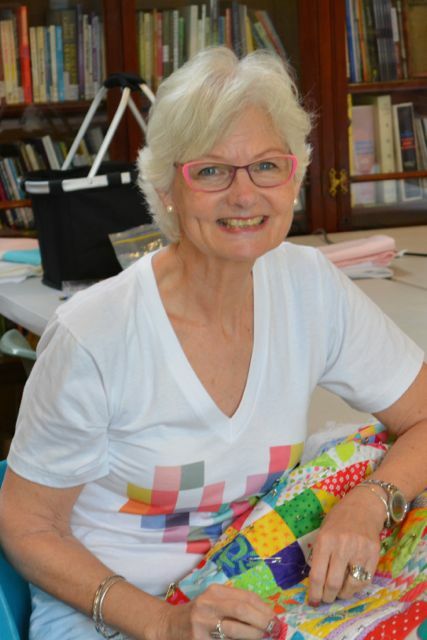 Di J and Di B: After a visit from American quilter, Linda Hungerford, in 2009, and hearing about the Stitchin’ Mission beginner quiltmaking classes she taught in local churches back in Iowa, I dreamed of doing something just like it at St Mark’s. The dream became a reality when Linda returned to Sydney later that year to visit her daughter, and agreed to teach the course while she was here. It was a crazy plan, with only two quilters in our congregation! Somehow, though, with Di Bracey’s help, “Team Di” signed up 24 enthusiastic beginners, and over the next 5 weeks we made fun and fabulous cot-sized quilts for the newly opened KU Marcia Burgess kindy for autistic children. 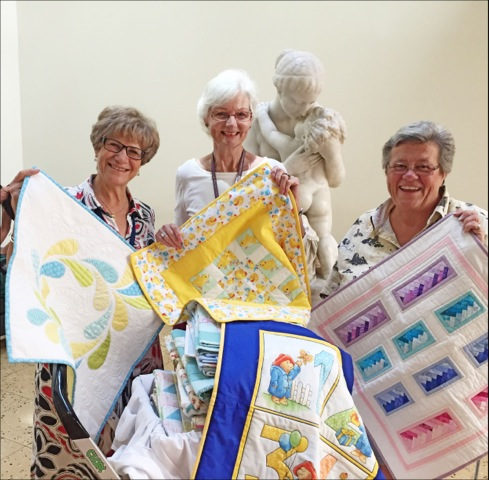 Some of our quilters enjoyed it so much we decided to continue and the monthly St Mark’s Quilters workshops came into being the following year. 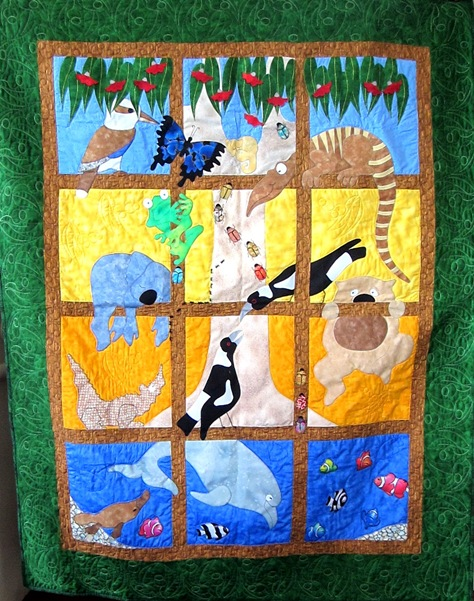 Tell us about some of the quilts/projects St Mark’s Quilters work on? Di J and Di B: We make two types of quilts. Using the RPA Hospital’s guidelines we make tiny Blankets of Love, approximately 24 inches square, to give to grieving parents who have lost a bub during, or soon after, childbirth, or to parents with a seriously ill bub in the NICU. 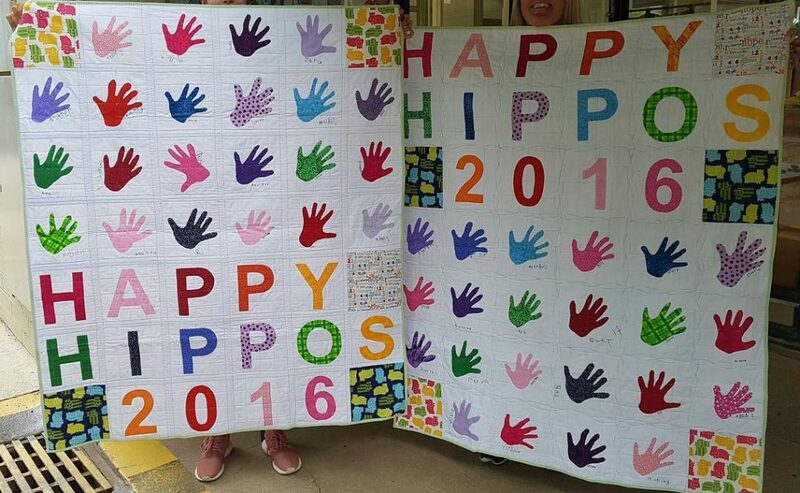 In addition, every child enrolled at The Marcia (a KU kindy named after our friend, the late Marcia Burgess) receives one of our cot-sized quilts to keep. These little children, and their parents struggling with the challenges of having an autistic child, really appreciate our comforting quilts. What’s next for you – where do you see yourself in two/five/ten years’ time (whichever you feel like answering)? 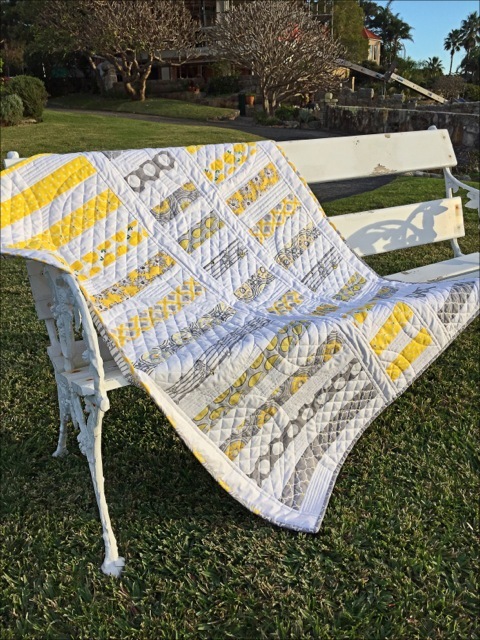 Di J: After my first quilt show entry, “Taking Liberties”, won third place in its category at this year’s Sydney Quilt Show, I’m looking forward to entering more shows. I find it exciting communicating with, learning from, and being inspired by quilters from all around the world through today’s social media, and I hope to grow these friendships in future, starting with my planned trip to Quiltcon 2017 in Savannah, Georgia, with Linda Hungerford. It’s my dream to have a quilt juried into Quiltcon one day. Di B: I’d love to work on improving my free motion quilting and my quilting skills overall, work through my stash of fabrics, and reduce the amount I’m collecting. 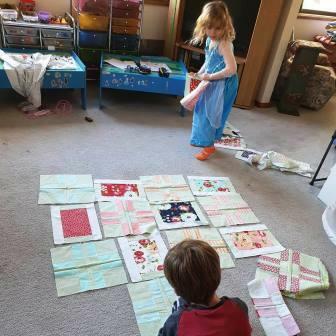 I’d like to hope that we are still successfully co-ordinating St Mark’s Quilters for many years to come, and making Blankets of Love and kindy quilts for babies and children. Where can we find you? (FB, Instagram etc). Di J: I’m on Facebook https://www.facebook.com/di.jobbins, but I’m most active on Instagram @darlingdi. I also have a blog which I’m working hard to write on a regular basis. www.snippetsnscraps.blogspot.com. Di B: On Instagram @dibracey, or via email at dbracey@aapt.net.au. If people are interested in attending St Mark’s Church, or St Mark’s Quilters, where can they find more information? Di J and Di B: Just pop one of us an email. 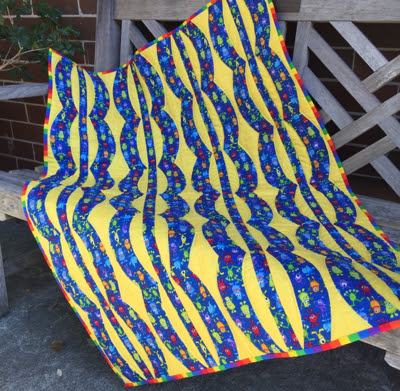 St Mark’s Quilters has a monthly Saturday workshop in our church hall at Darling Point (Sydney) and we welcome new members who already know the basics of how to make quilts. 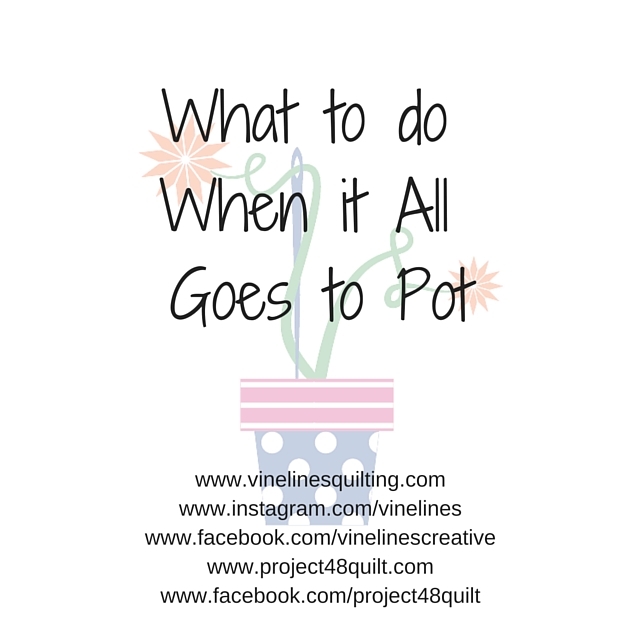 What Do You Do When it all Goes to Pot? Over the last month or so, events have transpired that have forced me to rethink where I’m currently headed, where I want to be headed and how those two things align, as well as the quintessential self-development question: “who am I and do I like who I am”?. The events that occurred hit me for a six and so I had to figure out how I was going to react and what I could learn from the experience. Herewith my thoughts on What to do When Everything Goes to Pot. Breathe – there’s a good chance not everything has gone to pot! Things always look worse than they are when they first happen. It’s so important to stop, take a breath and take a step back. Think about how you would like to respond. Responding straight away, in the heat of the moment, is not a fabulous thing to do. In fact, it can often make things worse! So stop. Take a deep breath. Count to ten. If you’re feeling guilty about something, apologise and decide to learn. Once you’ve stopped and had a think about things; how are you feeling? If you’re feeling guilty it may be because you need to apologise for something or it may just be because you aren’t seeing the situation from an objective standpoint. If you do think there’s something to apologise for – do it! Apologising is a freeing experience and once you’ve apologised, you’re putting the ball in the other person’s court – they no longer have power over you. Take stock – what can I learn? I firmly believe that nothing happens by accident. Sometimes (often!) we are put in unpleasant situations because there’s a lesson we have to learn and we haven’t been listening so we have to be whacked over the head with a blunt instrument. What other doors are there that may be opening? I’ve found that my focus has shifted over the past month so I’m now much more focused on building my own business so that I can be the sole breadwinner in our family and DH can be the housewife. Keep a look out for opportunities that you may not previously had time/motivation for and you might be pleasantly surprised at what presents itself. I hope you can see from this article that 99 times out of 100, when it seems that everything has gone to pot, there is a light at the end of the tunnel which is very likely to lead to something better. 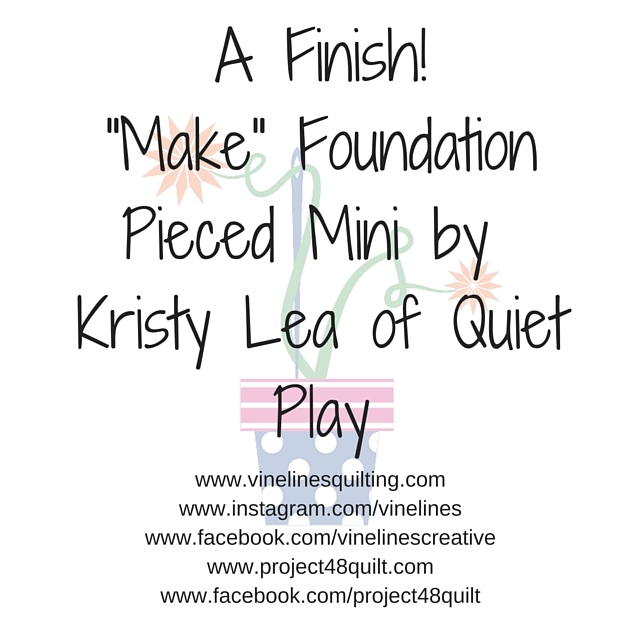 I have had the pleasure of testing a number of Kristy from Quiet Play’s foundation pieced patterns. They are imaginative, colourful and very clearly presented. A couple of months ago, Kristy called for testers for a new pattern. We were warned that it contained very small pieces and so, up for a challenge, I put my hand up. Very small pieces it certainly has! Some are less than ¼” inch in size. For this reason, it’s a pattern suitable for intermediate to advanced foundation piecers. The thing I love about foundation piecing is the way you can create designs that could not be done via ‘normal’ piecing and this is one of those designs. I love batiks and have quite a stash which I don’t use nearly enough, so I decided I would use batiks for this piece. I also used my other favourite foundation piecing tools: Aurifil 50wt thread in grey (colour 2615); my “Add and Eighth” ruler and a small 70/10 machine needle. When I’m working on bigger foundation pieced blocks I use the Add a Quarter ruler, but tiny pieces call for tiny rulers. In hindsight, there wasn’t enough contrast between the two fabrics so the “Make” doesn’t stand out as much as I would like. I’ve set myself some creative challenges for the year – I’m going to blog regularly – hence committing to Blossom Heart Quilts’ Sew Cute Tuesday linky each week; to take better photos and get my FMQ happening. 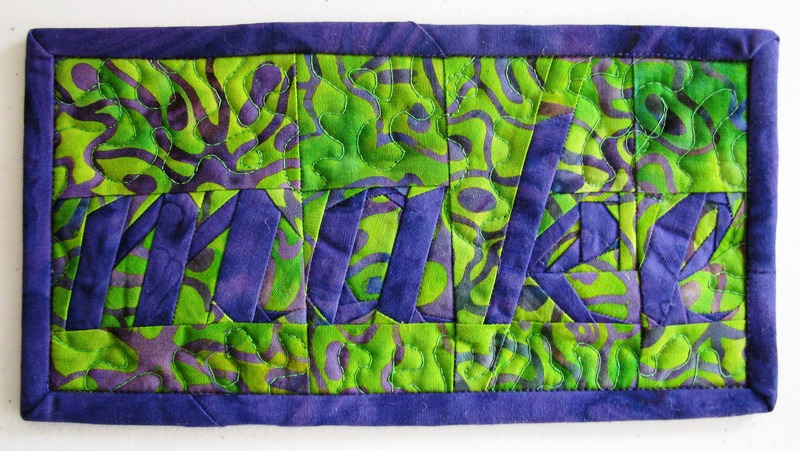 Thus, I quilted this using Rasant thread in a matching green – I hoped that would help the word to stand out a bit more. I used my Westalee Ruler Foot, which I just love. 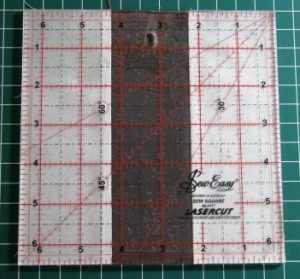 I’m still practising using the rulers with it but I use it all the time for FMQ. Kristy is currently having a sale at her Payhip shop – until 10 June 2016 there is 25% off all patterns using the code QP25. 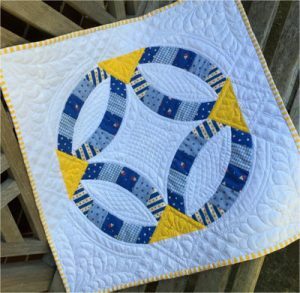 Go, take a look and have some foundation piecing fun! 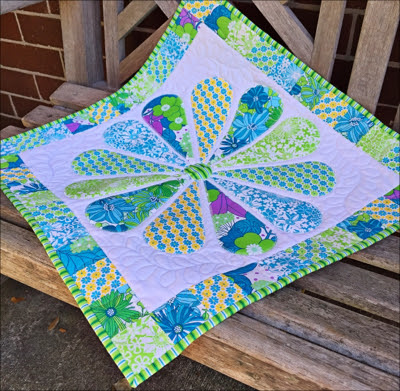 As always on a Tuesday, I’m linking up with Blossom Heart Quilts Sew Cute Tuesday linky (as I mentioned in the post itself – gah!). What are your creative goals for the week – what can you do today to move you closer to them?